You may have noticed that I changed the title of my blog to “Steph Cooks.” Here’s why. 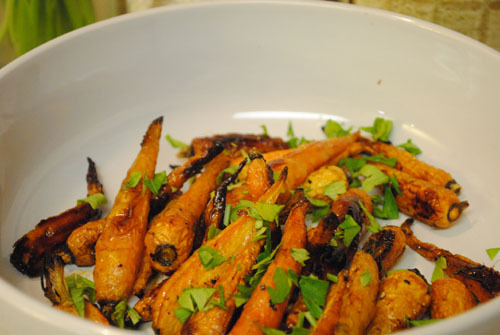 I named this blog Veggie in the House back when I was a vegetarian, and my focus was on creating vegetarian and meaty versions of the same dish. Now, I definitely still do that, but since I started eating meat again, I’ve drifted away from that model and have started posting all kinds of recipes. Lately, I’ve felt more and more like the blog name didn’t reflect me anymore, so I spend some time thinking about what it should be and settled on Steph Cooks. So, this is still the same blog, just with a different name. A name that is short, sweet, and happens to make a nice Twitter handle, which reminds me to tell you that I’ve set up @stephcooks for all my food-tweeting needs. So follow me if you want! Edit: I realized it would probably be better for me to change my existing Twitter account name (@slogerot) to the name I wanted instead of making a new account. Unfortunately, since I’d already created the new account, it’s a little harder than usual to get that done. So, I am working with Twitter to get my new account name, and in the meantime, just follow @slogerot. Sorry for the confusion. And if you happen to have bookmarked this site, please change the link name to reflect this new name. I really hate to be a pain and ask that. I promise this is the last time I’ll make that request. For reals. I have a yummy egg casserole I’m planning to post tomorrow, so maybe you will like it enough that you forget I even asked. A few years back, Mason and I went to a Christmas party where the host served some fantastic, slightly sweet cucumber martinis. Ever since, I’ve been a big fan of cucumber in drinks. When I came up with the idea of a cucumber-basil mojito the other day, I thought I was so frickin’ brilliant. A twist on the classic rum drink, adding cucumber and using basil instead of the traditional mint? Surely no one else had come up with the same concept. Alas, my claim to booze brilliance was short-lived. A few Google searches revealed that I was not, sadly, the first person to come up with this idea. I didn’t like any one of them in its entirety though, and some had no mojito-like qualities at all, like the one that used gin and lemon juice. What? Anyway, I adapted several recipes to come up with my own version, which Mason and I both agree is quite tasty. For a non-alcoholic drink, try using lemon-lime soda instead of the rum. Put basil and syrup or sugar in the bottom of a glass. Muddle the basil with the back of a spoon or the side of a measuring cup — you just want to bruise it to release its flavor. Fill the glass with ice and add rum, lime juice, cucumber, and soda. Stir to blend, and garnish with a cucumber slice. Makes 1 drink. 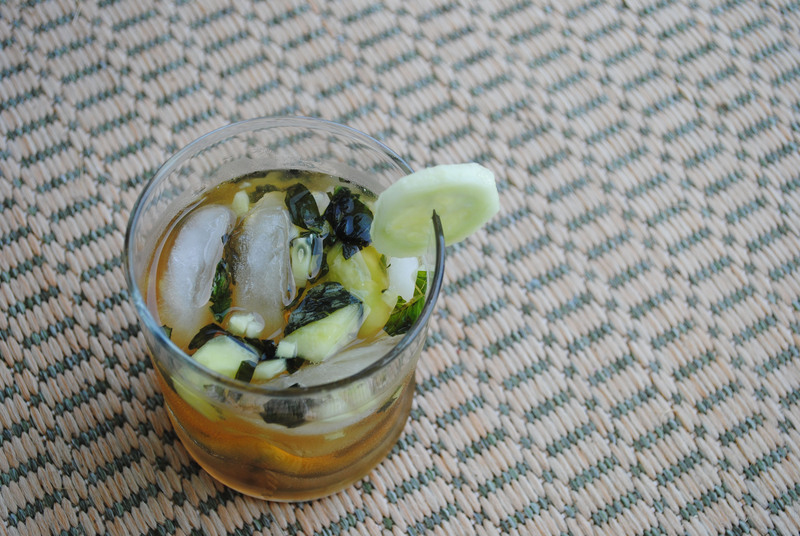 *I like how the drink looks with both chunks and small pieces of cuke floating around. Also, finely dicing one of the pieces releases a little more cucumber flavor into the drink. The Cedar Park farmer’s market is amazing! Have y’all been there yet? Mason spotted it this morning while he and Ryan were out getting breakfast, so they came home to get me and we headed over. Holy crap. It might be bigger than the downtown Austin farmer’s market at Republic Square park, no joke. They had TONS of farms there — you could get produce, eggs, all kinds of meat, flowers, honey, beignets and pralines, Goodpops (this by itself makes the whole thing worth it — there aren’t many things better than a pineapple basil popsicle), and so much more. They even had musicians playing at a small stage in the front. Anyway, wanted to give you a heads up to check it out if you get a chance. I just got a box of produce yesterday, but I picked up some home-grown tomatoes there. It opens at 9 am on Saturdays behind the Cinemark in the big shopping center on 1431. We’ve gotten a lot of green onion lately, so I was glad to come across this recipe, which uses an entire bunch (if you use both the green and white parts) and helped me make a big dent in my stash. Green onions are often used as an accent, but here, they’re the star. I’ve made a few small adjustments for readability and to lighten it a bit (like using low-fat buttermilk instead of full-fat buttermilk). You can easily sub green garlic or baby leeks if you want. These guys were light as air, which I suspect is a result of the combination of self-rising flour and cake flour. Self-rising flour has added salt and baking powder, and recipes that use it don’t usually call for baking powder, but this one does — probably another contributing factor to the biscuits’ airy texture. Sift together the self-rising flour, cake flour, baking powder, baking soda, sugar, and salt in a large mixing bowl. Using your fingers or a pastry cutter, squish the butter pieces into the flour until the mixture resembles coarse crumbs. Add the buttermilk, cheese, and green onions and stir just until the buttermilk and flour come together to form a dough, being careful not to overmix. You’ll know you are there when there’s no more loose flour in your bowl. Lightly flour a work surface with the all-purpose flour (I just line my counter with wax paper, parchment paper, or foil). Turn out the dough onto the surface and press into a disk about 1/2-inch thick and 8 inches in diameter. The dough will be very sticky, so flour your hands as necessary. Using a 3-inch round cutter dusted in flour, cut into rounds. (Be sure to press straight and downward when cutting the dough — a twisting motion will prevent the dough from rising.) I dust my cutter by simply dipping it into my flour container. Do this each time you cut a biscuit. Reform the scraps in order to make nine biscuits*. 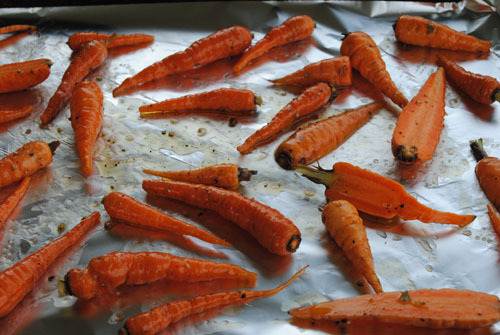 Place on a baking sheet greased with cooking spray (or on a baking sheet lined with a silicone liner like Silpat) and bake until golden brown, 10 to 12 minutes. 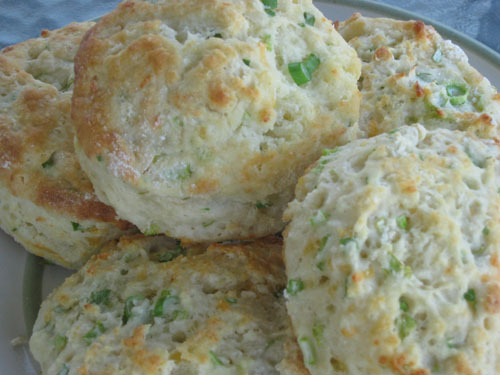 *The original recipe made seven biscuits, but I must be more efficient than Emeril because I got nine out of the dough. Here. For some reason I am nervous about this. But excited, too!